It had been a long, action filled Friday night, and the next afternoon, T & I needed something special. 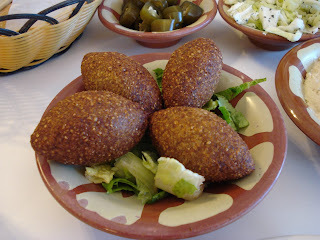 What better to fit the bill than Byblos Café? T had been promoting this restaurant since I had visited last year, and now was the time. Byblos Café is in an inconspicuous strip mall, located next to a Russian restaurant that is rumored to be hang out spot for the Russian Mob. Once inside, you can’t help but notice the refrigerator cases full of deserts and premade kafta kabobs, all looking very delicious, but first things first. A nice little spread isn’t it? Michael and I got right down to business, as we were both famished and I wanted to try everything. We got damn close to ordering everything, or that’s how it seemed to me. That’s something I haven’t seen since DC, homemade pita bread. 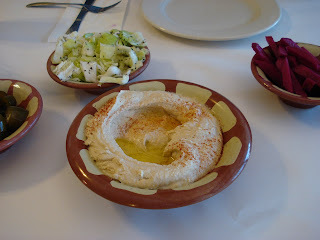 It was a little chewy but went well with the hummus, and it was miles better than any of that pre-made crap. 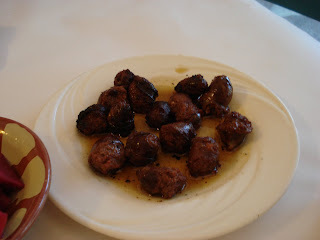 Sausage on a Mediterranean menu is new to me. They called it Makanek, and it was a homemade affair with a distinct lemon flavor. It was good on its own, but once you mixed it with hummus on some pita bread, it was a match made in heaven. 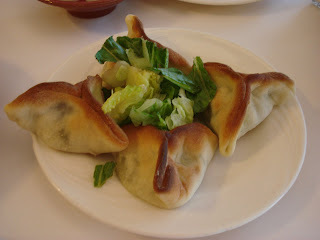 I’ve found that these three dishes are a good litmus test for a Mediterranean restaurant, and the kibbeh & spinach pies were pretty solid, but nothing spectacular. 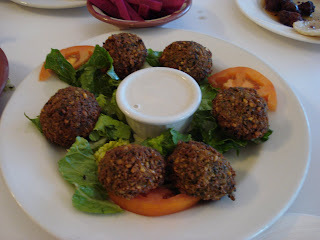 The falafel though, it had a rough texture and you could tell that it was homemade. 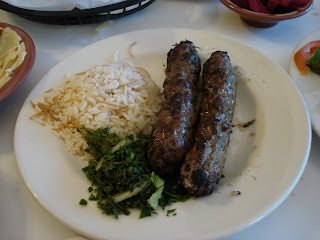 The piece de résistance, the lamb kafta kabob, I haven’t had a lamb kabob this good since Phoenicia in Houston. It was juicy and succulent with just the right amount of parsley and garlic. Just to be different, Michael ordered this chicken sandwich. 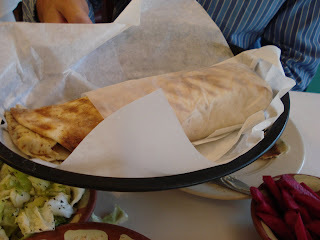 It was a pretty good sandwich but paled in comparison to the lamb kafta kabob. Since it was a late lunch and we were the only patrons, we received dynamite service and even got our desert for free! 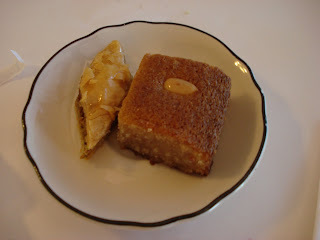 I’ve never had maamoul, but this was a dense cake where the bottom third was literally dripping with honey. I suppose you could make the argument that the baklava was a tad bit dry but I thought it was an excellent specimen. 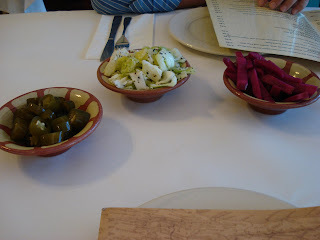 Needless to say, Byblos Café was an excellent lunch, and well worth the wait. 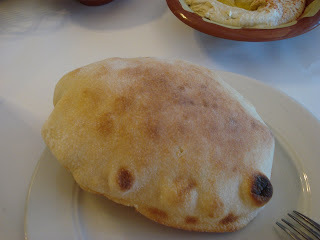 I heartily recommended it to anyone looking for their Middle Eastern cuisine fix. Wow, thanks for the enthusiastic comment. You've got a site on your hands.